Reading and share top 24 famous quotes and sayings about Information Technology by famous authors and people. Browse top 24 famous quotes and sayings about Information Technology by most favorite authors. 1. "In the pursuit of greater equality in our education system, from K to PhD, technology access, print literacies, and verbal skill all collide as requirements for even basic participation in an information-based, technology-dependent economy and society." 2. "Many professionals have to sign gagging clauses or face the sack if they speak out. The social worker and therapist was familiar with the scare that revelation brings to the survivor. […]We are in this story. It isn't ours, but we are in it nonetheless, not least because of the viscous campaign which has followed us over the last ten years. Any organisation with which we work may receive correspondence from the accused adults' and ‘false memory' movements. Some of these propagandists are confidentially dominating the professional and political arguments using new information technology to spread what we consider to be smears, innuendo and misinformation. P8(refers to authors Beatrix Campbell & Judith Jones – a journalist and a social worker/therapist)"
3. "Looking down the road, space exploration and the benefits it yields - in medicine and information technology - should not be overlooked." 4. "I am a technological activist. I have a political agenda. I am in favor of basic human rights: to free speech, to use any information and technology, to purchase and use recreational drugs, to enjoy and purchase so-called 'vices', to be free of intruders, and to privacy." 5. "Information technology has been one of the leading drivers of globalization, and it may also become one of its major victims." 6. "Computer games tend to be boys' games, warlike games with more violence. We have not spent enough time thinking through how to encourage more girls to be involved in computing before coming to college so they can see a possible career in information technology." 7. 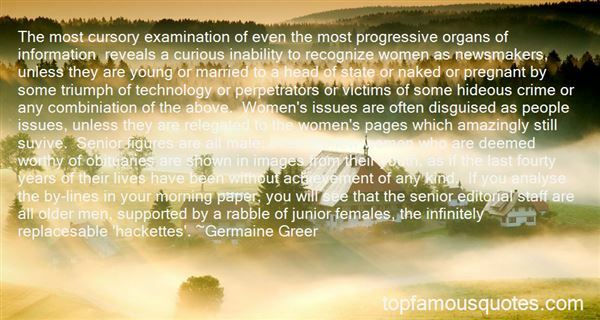 "The most cursory examination of even the most progressive organs of information reveals a curious inability to recognize women as newsmakers, unless they are young or married to a head of state or naked or pregnant by some triumph of technology or perpetrators or victims of some hideous crime or any combiniation of the above. Women's issues are often disguised as people issues, unless they are relegated to the women's pages which amazingly still suvive. Senior figures are all male; even the few women who are deemed worthy of obituaries are shown in images from their youth, as if the last fourty years of their lives have been without achievement of any kind. If you analyse the by-lines in your morning paper, you will see that the senior editorial staff are all older men, supported by a rabble of junior females, the infinitely replacesable 'hackettes'." 8. "I worked in information technology and academia for a long time and met many people who were better with things and ideas than with people." 9. "The reason is that till date, in spite of advances in information technology and strategies of information, the written word in the form of books still remains one of humanity's most enduring legacies." 10. "We have repeatedly demonstrated our species's bottomless ability to lower our standards to make information technology look good." 11. "They had studied law, information technology and art history as part of their beauty treatment, they had let Norwegian taxpayers finance years at university just so that they could end up as overqualified, stay-at-home playthings and sit here exchanging confidences about how to keep their sugar daddies suitably happy, suitably jealous and suitably on their toes." 12. "The bombs disrupted molecular structures. The cocktails included the distribution of nanotechnology to help to speed up the recovery of the earth - nanotechnology that promotes the self-assembly of molecules. The nanotechnology, speed up by DNA, which is an informational material but also excellent at the self-assembly of cells, made our fusing stronger. And the nanotechnology that hit the humans trapped in rubble or scorched land helped them to regenerate." 13. "We have seven pillars of development. India has a cutting edge information technology industry. We are setting up a technology park. We would like to see technology penetration iin education. Besides, we would like to see cooperation in industries like fashion, filmmaking, ship-building, education, health and energy." 14. "The demographic weight of countries such as China and India exercise a massive pressure on our wages and salaries. They have accomplished massive technological advances and the revolution in information technology has reduced the costs of transport." 15. "The networked world offers the promise that maybe the information technology industry will start to, for the first time in a decade or so, address CEO-level issues." 16. 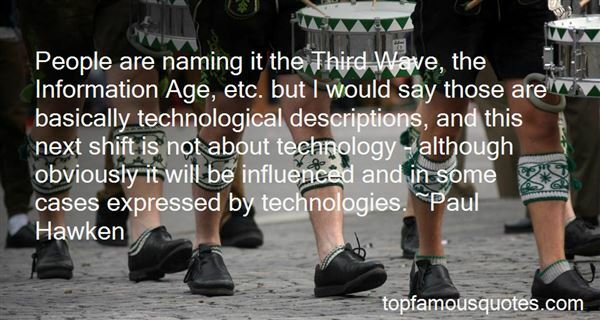 "People are naming it the Third Wave, the Information Age, etc. but I would say those are basically technological descriptions, and this next shift is not about technology - although obviously it will be influenced and in some cases expressed by technologies." 17. 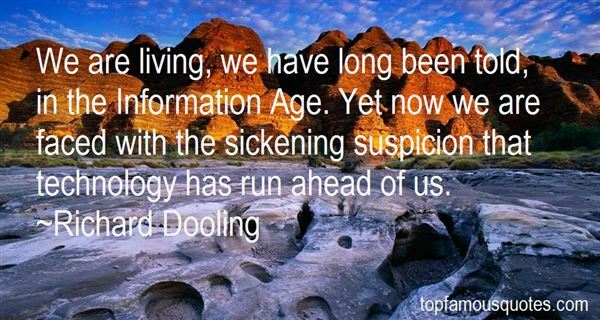 "We are living, we have long been told, in the Information Age. Yet now we are faced with the sickening suspicion that technology has run ahead of us." 18. "It's hard to pay attention these days because of multiple affects of the information technology nowadays. You tend to develop a faster, speedier mind, but I don't think it's necessarily broader or smarter." 19. "I also rise today in strong support of forward movement on the implementation of health information technology, which has the potential to save the United States billions of dollars in health care costs each year." 20. "As information technology restructures the work situation, it abstracts thought from action." 21. "The number one benefit of information technology is that it empowers people to do what they want to do. It lets people be creative. It lets people be productive. It lets people learn things they didn't think they could learn before, and so in a sense it is all about potential." 22. "A variety of national and international studies indicate that the broad-based deployment of information technology can have a substantial impact on our nation's economic productivity and growth as well as the educational and social success of our citizens." 23. "Developments in information technology and globalised media mean that the most powerful military in the history of the world can lose a war, not on the battlefield of dust and blood, but on the battlefield of world opinion." 24. "People live longer today than they ever have. They live happier lives, have more knowledge, more information. All this is the result of communications technology. How is any of that bad?" The arts (painting, poetry, etc.) are not just these. Eating, drinking, walking are also arts; every act is an art."